В рамках данной статьи, опишу процесс автоматической установки и настройки PowerShell Core и OpenSSH под Windows Server 2019 Build 17763. В качестве клиентской ОС – будет выступать CentOS Linux release 7.5.1804. 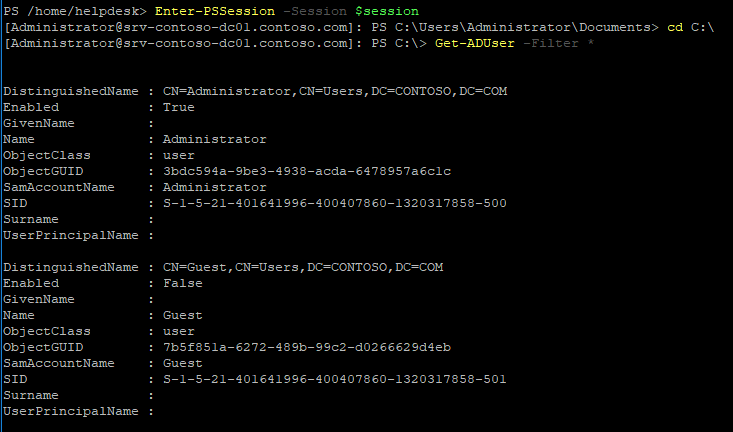 One solution is to create a symlink to the Powershell installation directory that doesn’t have spaces. You can currently establish a connection either interactively with user name and password or via key authentication. PSCredential is not yet supported. SSH connection attempt errors are not currently surfaced. There is a pull request with a fix for this. But for now you need to use Ctrl+C to abort the connection attempt and wait for the one minute session close timeout. To avoid connection errors make sure HostName and UserName names are correct and that the sshd service is running on the target machine. Endpoint configuration and JEA is not yet supported. Remote debugging from Linux to Windows does not work. However, remote debugging from Windows to Linux does work. Fan out to multiple machines not yet supported. sudo command does not work in remote session to Linux machine. Теперь можно использовать модуль Active Directory, DnsServer и многие другие в PowerShell Core.